Hook me up with WAGAMAMA baby !! 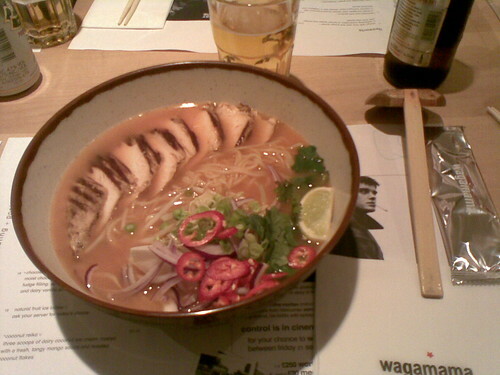 Japanese-style noodle restaurant chain Wagamama is being linked to a possible £200 million stock market listing. I just celebrated my bday yesterday going to the restaurant wagamama at subiaco , perth australia. Woke up this morning to see the news . ... that my favorite tukka joint ( noodle chain ) wagamma is pondering a ponder £200m listing. The company, which has been owned by private equity firm Lion Capital since 2005, is said to be talking over its options with advisers. Although a flotation is the firm's preferred choice, the Sunday Times said the business could also attract interest from rival restaurant groups and private equity investors. The newspaper said analysts believed the business may be worth in excess of £200 million - double its value when Lion acquired the chain. In the report, a company spokesman said: "Lion Capital will want an exit at some stage and all options remain open." Since opening its first site in London's Bloomsbury in 1992, the company has grown to more than 50 owned outlets within the UK and a franchise operation in several countries in Europe, the Middle East, Australia and New Zealand. It has also opened its first two sites in the United States, although this could delay any flotation as the company may want to first prove that the concept is successful in the region. The company will also have to weigh up current strong demand by investors for restaurant businesses. Other Lion investments include Kettle snacks, La Senza lingerie and cereals brand Weetabix.